WW1 Reenactments Equipment : Great War Tommy WW1 Food Rations Labels : Bon Accord Army & Navy M & V Ration Label. WW1 Reproductions and WW1 Reenactors Equipment / Kit - Bon Accord Army & Navy M & V Ration Label. Worked up from a 'part' label. 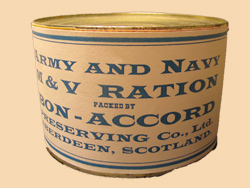 Army and Navy meat & veg' ration label from the Bon Accord Preserving Co, of Aberdeen, Scotland. Altered to fit 4" dia x 2.5" tins. "Bon Accord" is the motto of the city of Aberdeen.